2017 was a turbulent year in Prince Edward County for single-family homes worth $300,000 and up. The County market heated up and then cooled off in tandem with the Toronto market, ultimately bringing good news for buyers. However, things were different for homes under $300,000 where monthly sales remained below seasonal norms throughout the year. Given the distinct dynamics for each market, this report will focus on homes over $300,000 while a future report will be devoted to the market for homes below that figure. As I have pointed out on numerous occasions, most buyers for homes worth $300,000 and over come from Toronto, where people have been taking advantage of the historical increases in house prices there to buy a place in the County. It should come as no surprise, then, that sales over $300,000 in Prince Edward County closely track detached homes sales in the City of Toronto. 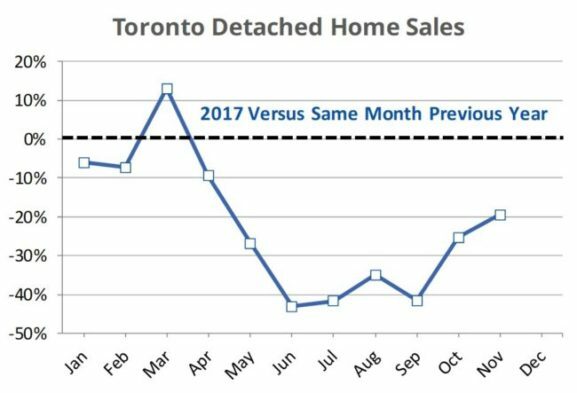 The graph above shows the number of monthly detached home sales in the City of Toronto during 2017, expressed as a percentage of the number sold during the same month in 2016. 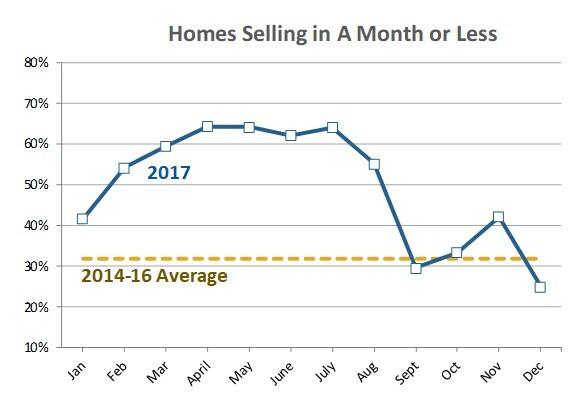 Up until March, homes were selling roughly at the same pace as in 2016. In April, however, the province announced a foreign buyers’ sales tax to try and reduce demand and cool off prices. The pace of sales began to slow almost immediately, reaching a point in June where the number of homes sold this year was down more than 40% from June of last year. 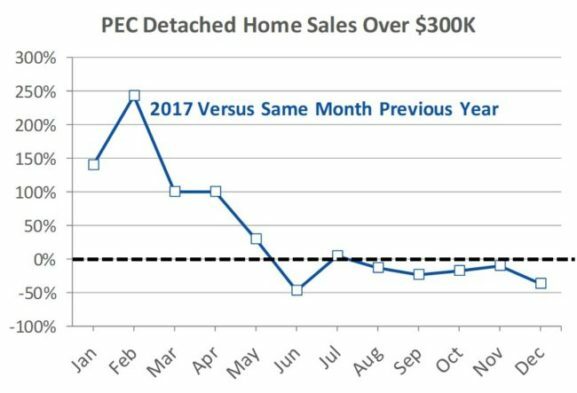 Although the pace of sales has increased somewhat since then, as of November it was still down 20% from the same time last year, suggesting that it’s too soon to tell whether the market has recovered or not. Turning to sales of homes over $300,000 in the County (above), it’s clear that local sales have tracked Toronto sales. Although the number of homes sold in the first three months of this year rose way above last year – a hot market which broke all-time sales records- just as in Toronto, the pace of sales began to slow in April, and remained significantly below last year through summer and fall. The impact of the sellers’ market and subsequent slowdown was also reflected in the time homes took to sell. From 2014 to 2016, on average a third of homes sold in a month or less. This year, in the initial sellers’ market, this rose to two-thirds. This began to change over the summer with results returning close to “normal” by the end of the year. Although it has been commonplace in Toronto (at least until recently) for houses to sell for listing price or more, historically that has not been true in Prince Edward County. On average, from 2014 to 2016, only 14% of homes sold for listing price or more here. That changed during the red-hot market at the start of the year when more than half of homes sold for listing price and above. With demand falling during the second half of the year, the percentage of homes selling for listing price or more dropped back close to historical levels. The selling to listing price ratio provides another indicator of seller expectations. For 2014 to 2016, homes sold on average for 95% to 96% of listing price. 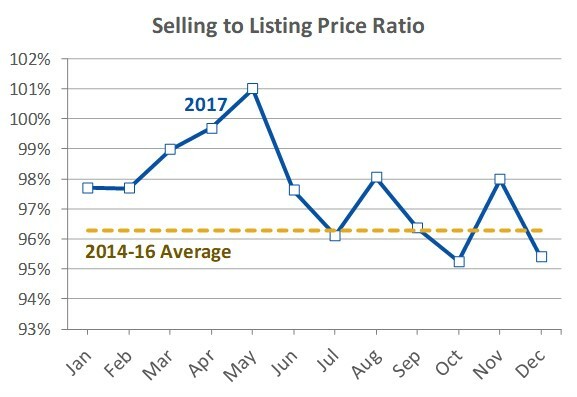 In fact, the average selling to listing price ratio has remained consistently in this range since 2011. (Results for individual homes can obviously differ considerably from this average). During the second half of the year, however, the ratio returned to roughly normal levels, suggesting that sellers’ expectations were coming down to earth as sales fell and bargaining power had shifted more toward buyers. On a different note, I had several buyer clients who were disappointed by the limited selection of homes available during the fall, despite the market slowdown. As sales slow, inventory would normally pile up, offering buyers greater selection. In this case, inventories have reacted slowly to the market slowdown, only returning to pre-bubble levels at the end of December. 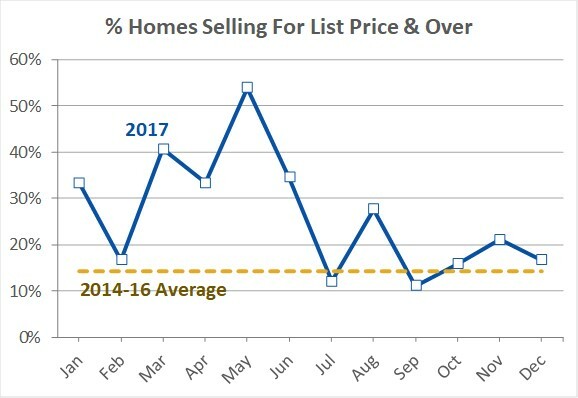 Overall, the second half of 2017 has brought good news to buyers with falling demand, slower sales and larger “discounts” from listing price. However, I will end this report with two cautionary notes for potential buyers of homes over $300,000. First, though homes are now staying on the market longer, inventories remain low. If you find the ideal house, move quickly because another one may not come along for a while. Second, the County market is heavily influenced by the Toronto market, but no one can definitively predict what will happen to Toronto in the months ahead. History has shown that the Toronto market can experience prolonged downturns such as the one which lasted from 1990 until 2003, with prices taking 13 years to recover to 1990 levels. On the other hand, Vancouver was hit by a provincial foreign buyer’s sales tax last year, and while it experienced a short downturn, it quickly returned to a sellers’ market. If Toronto turns into a prolonged downturn, there is less urgency to buy quickly and you can more confidently wait for your dream property. On the other hand, if you see signs that the Toronto market is starting to rebound from the foreign buyers’ sales tax, it would be wise to act sooner before the sellers’ market returns to the County.